The Cadets dedicated their 2002 show, "An American Revival," to the spirit of renewed pride in America that swept the nation in the aftermath of the terrorist acts of September 11, 2001. 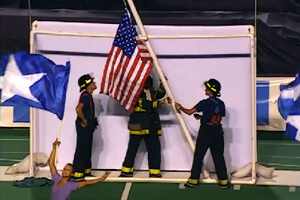 At the end, witnessed only at the World Championship Finals, three members attired as New York City Fire Department rescuers re-created the famed rising of the American flag over the ruins of the devastated World Trade Center. Across the street from the University of Wisconsin's Camp Randall Stadium sits a station of the Madison Fire Department. Upon receiving the signal, sirens on fire trucks and flashing lights announced solidarity with the firemen's brethren in NYC. For an instant, the diversion of drum corps and the reality of the outside world blended into a moment that perfectly captured the optimism of a nation still recovering from the effects of 9/11.